This weekend my friend turned 50 and threw a great party. She hosted the event at the Hilton in Vancouver, Washington. The Christmas tree in the event room fit the party perfectly. All the lights glowing from it, it made the perfect photo prop. Lots of selfies were taken in front of this tree. Me included. And it was the perfect spot to place the birthday gifts. 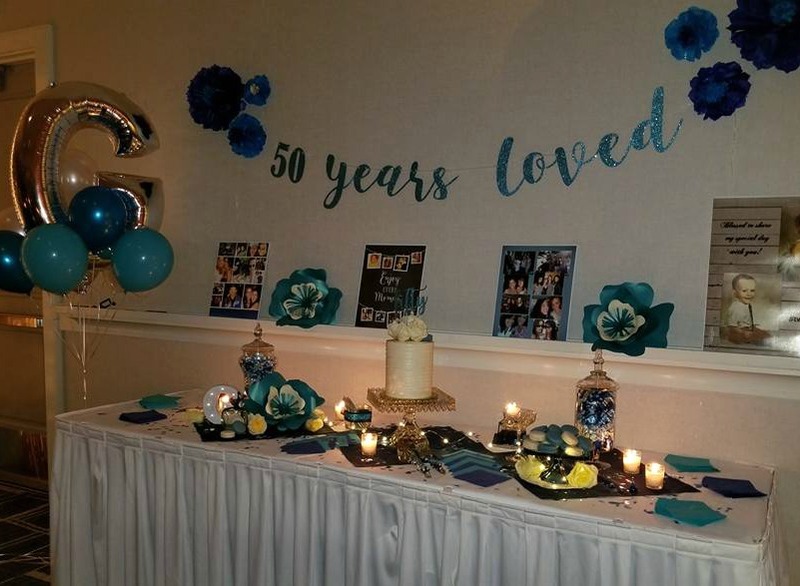 The theme of the party was my friends favorite color, blue, and the saying '50 years loved'. The theme fit my friend perfectly. The room was full of so many friends from near and far. Truly, 50 years loved. 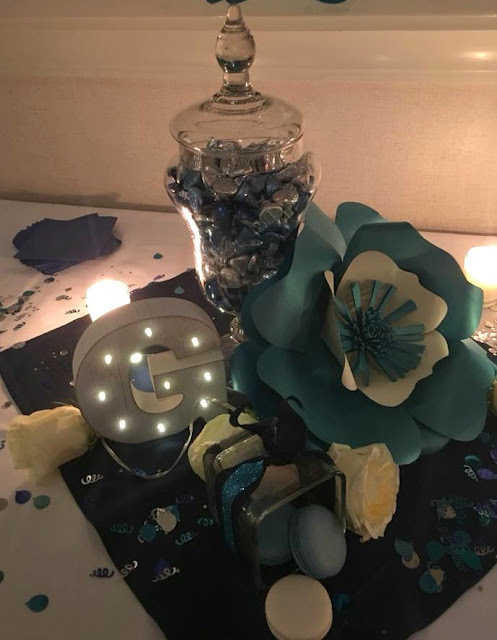 I'm not a big fan of blue but I loved it here at my friends birthday party. The touches of silver, cream and candle light gave her party such a warm touch and really reflected my friend. She did a great job of styling her own party. I was more than happy to be a sounding board for her as she planned her own party. Helping her make decisions and listening to ideas. 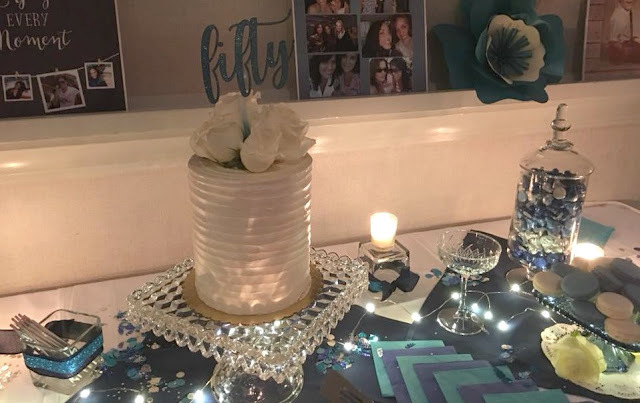 I ran 3 miles the morning of the party because I was looking forward to this cake. Inside was blue velvet cake. So pretty and a fun surprise. 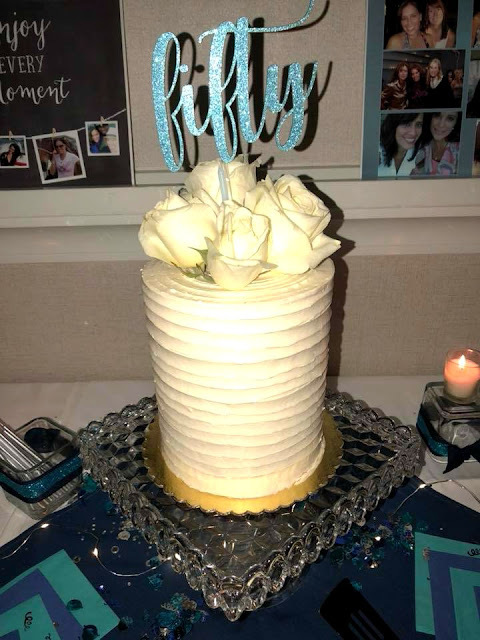 Like many people do at their wedding's, my friend served sheet cake to the guests instead of every one having to wait for this cake to be cut. The candle light on the table was so pretty. The lights in the room were down low to high-light the full effect of the candle lights glow. I feel like I should do one of those puzzles, how many G's do you see in this post. Would you have noticed the G's if I wouldn't have said that? My friends name starts with a G, obviously. I like how she incorporated them into the décor so that they blended in. I totally had a few of those macarons too. 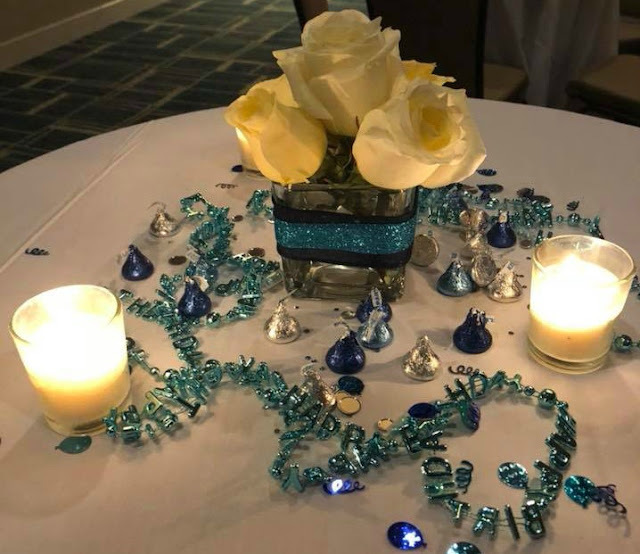 Each table had a vase of roses, candles, tasty Hershey's Kisses in her party themed colors and birthday necklaces in her party colors. This was a fun idea. 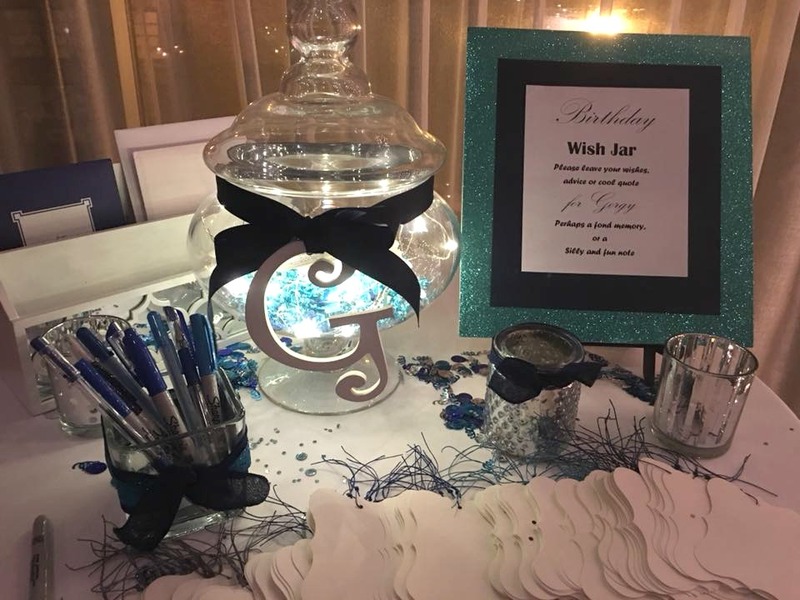 My friend had a Wish Jar for all her guests to leave her a birthday wish. I can imagine her sitting on her comfy couch with a fire roaring in the fire place, a nice glass of wine and reading each wish left by her friends. If you have a milestone birthday coming up what theme would you chose? I'd love to hear it. 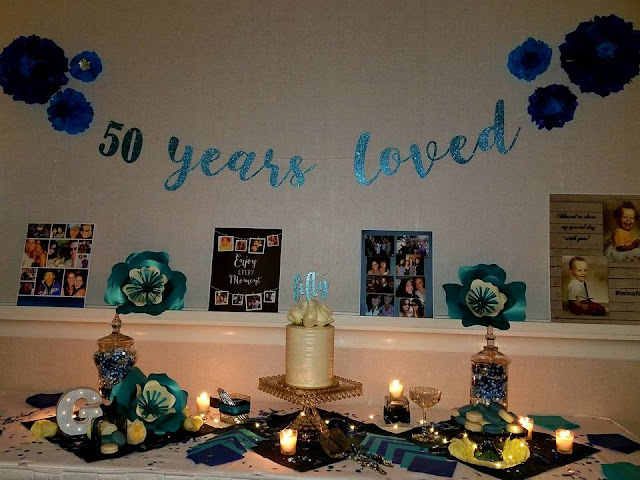 Gorgy did an excellent job decorating for her party. It was beautiful. I loved everything about this night! 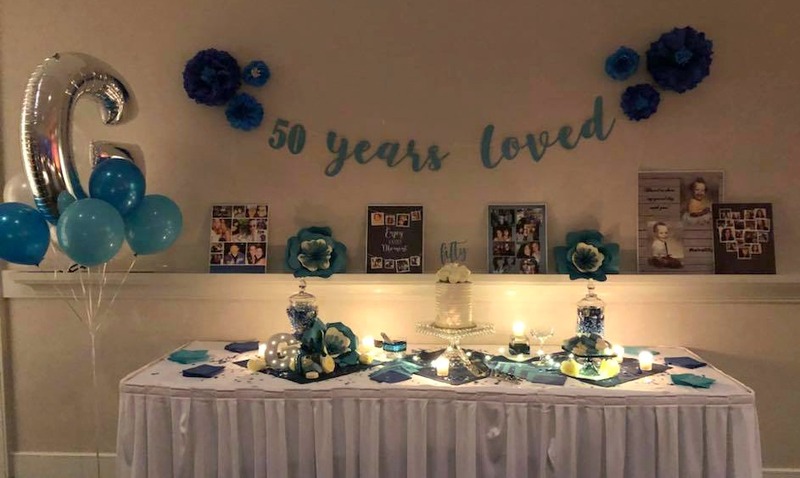 Your party was wonderful and you did a great job with all the décor. It was so magical and such a fun night.